« Skiing, just 5 miles away! The lumber mill was the heart and soul of McCloud for many years – starting in 1896. 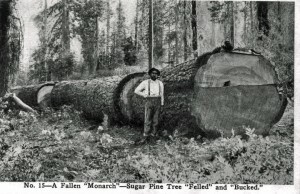 Enjoy one of the historic pictures of a sawyer next to a felled tree (photo courtesy of the McCloud Museum). The mill was referred to as “Mother McCloud” – workers enjoyed housing, medical etc all through the local mill. Most of the buildings in the town today were built by the mill to house their workers.